Once again, today proved that ministry and school can collide, and that no matter what we’re doing, we can learn something meaningful. After breakfast this morning, the three younger boys and I mixed a geography/history lesson with our outreach to Gladis, the girl we sponsor through One Child Matters. 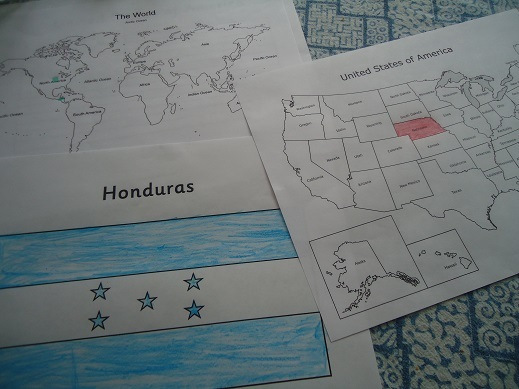 We did a little research on Honduras, where Gladis is from. 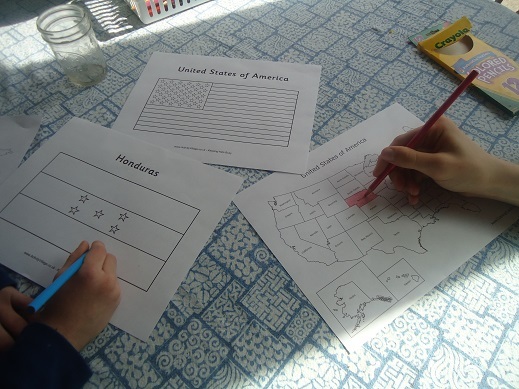 We printed out and colored maps and flags to send to her. We talked about the distance between our home and Gladis’ (roughly 1900 miles). And we marveled at how big God is to connect us to her in this awesome way. I should make something clear: My three younger boys are 9, 12, and 14. They don’t sit and color pictures anymore…ever. But when I told them we were making these pages for Gladis, they ran for the colored pencils – even discussing how colored pencils would be better than markers for this assignment because it would look so much nicer and Gladis could see the maps better. Anytime I mention doing anything for Gladis, their response is always joyful and eager. The end results of our creations are simple. We thought maybe Gladis would have fun coloring the rest of the maps, so we left a lot for her to fill in. But we wanted to show her where in the U.S. we are located (Husker red, of course). Do you see the blue shaded areas on the world map below? That’s to show her that she is there, in Central America, and we are here in Nebraska, USA. We’ll be writing a note at the top of that map, letting her know that we are praying for her, that God is taking care of all of us, and that we are sending our love from our home to hers. I always wish I could see her face when she receives our packages. I’m told that pictures and maps like this are a treasure to these sponsored kids as they typically don’t have many items like this in their homes. How wonderful that such a simple school lesson for our family will be such a wonderful blessing to Gladis and her family. Check out this cool Distance Calculator to discover about how far away your sponsored child is from where you live. If you’re not yet sponsoring a child, please join us! I’m celebrating this ministry for Gratituesday today, because of the blessing it is to my family. I want you to experience this too. Bless a child – be blessed. What a rich gift. Now your turn. Share what you’re thankful for! Leave a comment on this post letting us know how God is working in your life. If you’ve written a blog post about what you’re thankful for, leave the link in the comments so we can visit your blog to read about it. We love sharing and reading about God’s blessings! Sometimes, I get a bad case of the “shoulds.” You know when you want to say, “Well, I guess I should…” but you really don’t want to. I’m grateful today that God has the cure! Loved the way the three boys could connect and work together for someone else. I’m thankful today that we can help others and God wants us to do that to help them but also because He knows how good it is for us too. Today I am grateful for you, Laura, and for your wonderful idea and printable links. We sponsor an 8 year old girl named Meme through Compassion. Her birthday is coming up soon and we are preparing her next letter with some extra goodies to go in with it. I think this idea of sending maps to her is just fabulous! Thank you so much for sharing your brilliant idea. My girls are going to LOVE finding her on the map, coloring the maps, and learning a little more about where she lives in relation to us. I just love it when I can mix homeschool and real life. Thanks again!! How beautiful that your boys have such tender hearts for Gladis! I’m fairly new to your blog and love it. I’m thankful to have found the site with so much great information about the real food. I made the switch to milling last August and love having lots of new recipes. I’m also grateful to recently becoming a stay at home mom again after 11 years working outside the home. Blessings to you, your family, and online community! To see God working in my life.